Definition at line 337 of file pstypes.h. Referenced by GetProcessAffinityMask(), and NtQueryInformationProcess(). Definition at line 338 of file pstypes.h. Definition at line 335 of file pstypes.h. Referenced by _main(), GetExitCodeProcess(), and NtQueryInformationProcess(). Definition at line 340 of file pstypes.h. Referenced by CSR_API(), and NtQueryInformationProcess(). Definition at line 336 of file pstypes.h. Definition at line 404 of file winternl.h. 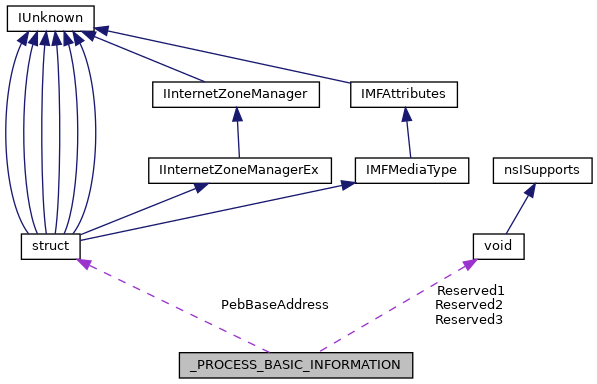 Referenced by EnumProcessModules(), FindModule(), GetProcessVersion(), NtQueryInformationProcess(), PsaEnumerateProcessModules(), RtlCreateUserProcess(), RtlpQueryRemoteProcessModules(), and UserpGetClientFileName(). Definition at line 403 of file winternl.h. Definition at line 405 of file winternl.h. Definition at line 407 of file winternl.h. Definition at line 406 of file winternl.h. Referenced by GetProcessId(), NtQueryInformationProcess(), and SmpApiLoop().